Remembering World Series History with 8 Objects in Play Ball! Our exhibit Play Ball! A Celebration of America’s Game features artifacts from some of the most noteworthy World Series, from the controversial 1919 games to the perfect game of 1956 to the first series the Colorado Rockies played in, in 2007. Here are the stories behind them, but you’ll want to see the objects for yourself! This trophy went to catcher John “Chief” Meyers. One of the notable things about this series is that there were six consecutive days of rain between games three and four, in a series the Giants played against the Philadelphia Athletics. The Cincinnati Reds beat the favored Chicago White Sox. A year later, eight White Sox players were accused of conspiring with gamblers to lose. All eight were permanently banned from playing in the major leagues, including “Shoeless Joe” Jackson, who continued to play with this bat in semi-pro games after the Black Sox Scandal. From 1947 to 1964, the World Series featured at least one of the three New York teams. In 1951, the Yankees nabbed their third straight title in a row. 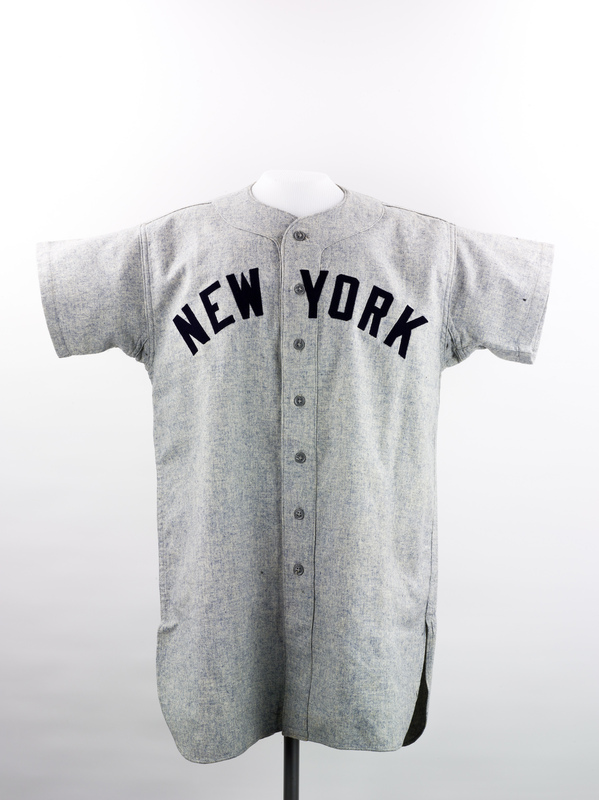 It was the last World Series for Joe DiMaggio, who wore this jersey when he hit the final home run of his career. And it was the first series for rookies Willie Mays and Mickey Mantle. The only perfect game ever pitched in the World Series was game five in 1956. New York Yankees pitcher Don Larsen struck out every Brooklyn Dodgers hitter, and the Yankees won 2–0. Bill Mazeroski is the only player in baseball history to realize the iconic dream: He hit a home run in the bottom of the ninth inning in game seven of the World Series to break a tie. His homer won the Pittsburgh Pirates the 1960 series. The Brooklyn/Los Angeles Dodgers’ left-handed pitcher Sandy Koufax was the first major league pitcher to pitch four no-hitters. But in 1965 he garnered criticism for refusing to pitch game one of the World Series because he was observing the Jewish holiday Yom Kippur. In 1966, he pitched his last game in the World Series against the Baltimore Orioles. He gave this glove to umpire Doug Harvey as a thank-you for Harvey returning Koufax’s World Series lighter—which he’d left on a bar. When the Orioles won the series, the team signed third baseman Brooks Robinson’s bat. They called Reggie Jackson “Mr. October” because of his knack for rising to the occasion in the postseason. His most memorable playoff moment came in game six of the 1977 World Series, when he hit three consecutive home runs on the first pitch from three different pitchers. In 2007, the Colorado Rockies made it to the World Series for the first time. These items are on loan from then-pitcher Jason Hirsh. In honor of an excellent Colorado Rockies season, this exhibit has gone into extra innings! We’ve extended the run of Play Ball! A Celebration of America’s Game through January 6. Come see this compendium of classic baseball memorabilia, and bring your friends and family over the holidays.